SwitchMetrics is developing an Internet of Communications solution. Leveraging insights from the SwitchMetrics dashboard, incorporating social and predictive analytics and a digital marketing platform to drive real time offers and new telecommunication service delivery. The SwitchMetrics dashboard provides operational metrics on the people that call SMBs, enabling the SMBs to grow their own business revenues. 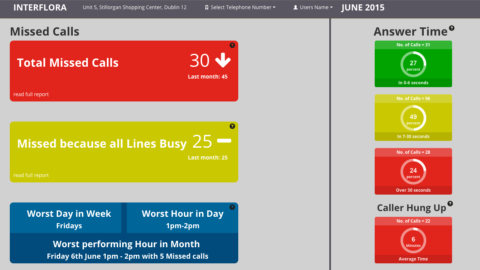 Think of it as Google analytics for telephone calls. For more information, visit Switchmetrics. Milestone I: Demo prototype of dashboard developed. Milestone II: One of ten early stage startups accepted into NDRC Launchpad tech Accelerator September – December 2015. Milestone III: €5k funding obtained towards development of an operational prototype (target completion July 2016).